In 1982 when I was in first grade at Hillel Day School, a Jewish day school in Metropolitan Detroit, my father brought in our family’s Apple II computer for show-and-tell. There were no computers in the school at that time so it was a seminal technological moment for the school. I’m sure my father figured he would blow my classmates minds by showing them how to type a few lines of the LOGO programming language and get the turtle cursor to turn and move across the screen. However, my peers didn’t have any mind-blowing experiences that day -- it was only the beginning of what our generation would come to expect from computers and technology. Fast forward to 2013 when, earlier this week, I was a guest speaker in my son’s third grade classroom at the same Jewish day school. Speaking on the subject of technology and Jewish education, I became nostalgic and told the students how when I was their age we would save one word processing document on a floppy disc. I then took a USB flash drive out of my pocket to explain Moore’s Law -- the observation that, over the history of computing hardware, the number of transistors on integrated circuits doubles approximately every two years. They weren’t impressed. These young people have become accustomed to better, smaller, faster technology being rolled out every few months. They see their parents turning in their smartphones for better ones and downloading new versions of operating systems. They know that the graphics on the next generation of video game consoles in their basements will be more realistic than the ones before. I felt like a dinosaur in that classroom as I explained that when I was in third grade at that same school we had a computer wheeled into our classroom once every two weeks and would wait in line for our five minute turn. They laughed at the thought of this as they sat there with their iPads looking at a SMART board their teacher used her finger to write on and it immediately recognized the writing and translated it to a typed font. What could I possibly show them to impress upon them how miraculous technological innovation has been in my lifetime? I wanted to hear some “oohs” and “aahs” from these 9-year-olds about how technology has changed so rapidly that their elementary school experience is so vastly different from their parents’ experience, let alone from their grandparents’ experience. And then it occurred to me. Google Glass! I’ve been reading about Google’s Project Glass research and development project for some time now. I’ve also been thinking about how this wearable computer with a head-mounted display can be used to bring augmented reality to Jewish education. Since I wasn’t selected as a reviewer of the Google Glass I didn’t have a pair to show the class, but I could show a YouTube video of what Google Glass does on the SMART board. The kids were amazed at the idea of augmented reality. AR gives the user – in this case the wearer of the Google glasses – a view of a physical, real-world environment whose elements are augmented by computer-generated sensory input such as sound, video, graphics or GPS data. We talked about how students in a Jewish day school could walk around a synagogue wearing Google Glass and get background information on everything they encountered. When they looked inside the Torah scroll they could immediately call up an English translation of that text and view it off to the side while still looking inside the scroll. We talked about touring in Israel, something they will do in eighth grade, and being able to use GPS navigation while in real time seeing the sites of the Old City of Jerusalem. They could simultaneously view the buildings of today’s Jerusalem while seeing an overlay image of what that area looked like millennia ago. The cameras in the Google Glass are able to intercept the real world view and re-display its augmented view through the eye pieces. 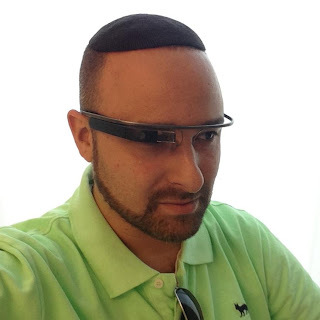 Eager to come up with more ways that Google Glass could augment Jewish education I had a Skype conversation with well-known techie Hillel Fuld who lives in Israel. Fuld is senior evangelist at Inneractive, an Israeli-based mobile advertising company. I knew that he had taken Google Glass for a couple test drives and I thought he might have some ideas to share about how this technology could be put to use in the Jewish educational arena. Fuld was able to use the Google Glass glasses that a member of Google’s Glass team had for development purposes. Fuld found Google Glass to be very impressive. “They are very futuristic and they impressed me on a philosophical level,” he said. The first application that came to mind for Fuld was for students to be able to sit in a classroom wearing Google Glass and learning about the Temple that once stood in Jerusalem. It’s one thing to see two-dimensional models of the Temple in a textbook, but these glasses will allow students to take a virtual tour through the Temple while sitting in a classroom in North America. Fuld remarked that the most impressive thing about the Google Glass was the instantaneous response time. The device's camera was instant as was the response when he told the glasses to take a photo and then share it with friends. "Learning Talmud, for instance, in a foreign language is difficult for the average student and Google Glass can help make that experience interactive and simpler," Fuld said. "As for learning Talmud while wearing Google Glass, it can give explanations, translations, and references to other texts in real time." Augmented reality is the obvious application for Glass and bringing ancient Jewish history to modern times with this device will make it more alive and relevant." Fuld also remarked that Google Glass has the ability to teach basic Jewish concepts to learners of all different ages. "The potential there is huge, I mean you're looking at a candy bar and it tells you what bracha (blessing) to make." Google Glass is currently just a prototype, but it’s a sign of great things to come. My classmates back in the 1980s might not have been impressed when my father brought that Apple computer into my classroom. And, similarly, my own son and his peers were not blown away when talked about the leaps in technological innovation in my lifetime thus far. However, they were able to see how innovative Google Glass will be. Indeed, it will be their generation that will be coming up with the applications for this augmented reality. And then they’ll try to explain to their own children a generation from now why Google Glass and augmented reality was such a watershed moment in the Digital Age.